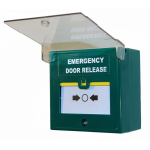 In the event of an emergency, if your door is not connected to your fire alarm system and you need a way to release the access controlled door, a break glass unit is the perfect solution to your problem. A break glass unit enables free flow of traffic through restricted doors, so don't panic because this device will ensure your safety in fire emergencies. Within our range, each unit is coloured in green to ensure it can be seen in the event of poor visibility. In addition to these essential units, we have protective alarmed covers, also known as stoppers, to prevent the break glass unit from accidental damage and vandalism. In order to reset the break glass unit alarm once the all clear has been given, we sell reset keys at competitive prices. So you can work confidently knowing you will be safe with an affordable break glass unit ready for in the event of an emergency.